Out There: 3D or 3Don't? 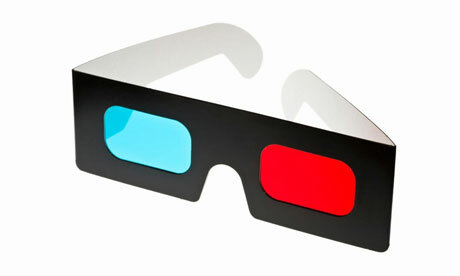 There's an interesting article in The Guardian today about the rather dissapointing sales of 3D cinema tickets in 2011. Initially the 2009 reboot of 3D films that avoided the old red-and-blue glasses of the 1950s proved very popular, with James Cameron's Avatar being made specifically as a flagship for the technique, and no one can say that it wasn't a very pretty film (even if the plot wasn't as groundbreaking as the effects. The jury's still out on whether it was a blue version of Pocahontas, Fern Gully or Dances With Wolves). For a while 3D films did well, but now their popularity seem to be declining rapidly, with more people opting for the standard 2D versions. The author of the report on this believes that now the inital period of experimentation is over it's mainly due to the recession. When a 3D ticket costs half-again as much as a 2D ticket it's just too big a spend, espcially if the cinema trip is a family outing. Additionally those with contacts or glasses may find the 3D specs hard to wear, and a friend of mine who is partially blind in one eye can't see 3D at all - she has to wear the glasses just to stop seeing the picture in double! However the theory that it's all down to the recession has a problem as it assumes that once the economy picks up the 3D ratings will return fully to their old figures. I don't think that will be the case, in fact I think there's something else going on altogether. Movies with a high amount of CGI visual effects lend themselves more easily to this format, as the 3D effect can be integrated during the creation of a sequence rather than tacked onto footage of physical effects afterwards. Often this means fantasy movies, computer-animated movies, or sometimes movies with a high proportion of faked explosions! The 3D effect works best during scenes with a lot of screen depth. That seems like an obvious thing to say, but in an intimate scene where two people are talking in a room there is very little point in forcing that depth perception because a) you'll just hit the wall the of the room and have no further back to go and b) scenes like that aren't powered by visual effects but by emotional energy. Avatar and How To Train Your Dragon had some great 3D moments because they both involve flying scenes in vast landscapes, so the 'distance' between the background and foreground is far more dramatic. Gimmicks don't work. I found 3D innovative not because it brought the foreground forwards, but because it pushed the background backwards. A movie is a self-contained world so giving it depth is fine because I can easily believe that I'm just watching that world through a sheet of glass, but if you make things jump out at people you break the Fourth Wall and this can upset their suspension of disbelief and ruin the illusion. Even some of the films with better usage of 3D can't seem to resist the urge to try and poke you in the eye with something. HTTYD only did it twice, but it was in those moments that the effect was at it's weakest. I love that film unreasonable amounts, however I still find those few seconds jarring. With all that in mind, I think that it's more than empty pockets that is hamstringing 3D at the moment. Probably 3D sales will recover somewhat when the economy does, but the key word here is Gimmick. 3D is a gimmick, and that's not necesarily a bad thing when it's used right but gimmicks do tend to have a very short shelf life because once we've got over the novelty of them we don't care any more. It happened in the 50s and it'll happen again. Even in a recession people are still willing to pay for extra bits and pieces if they feel they are getting added value for their money, but 3D isn't added value for the following two reasons. If a story is good, 3D won't improve it. If a story is bad, 3D can't save it. We never really went to the cinema to marvel at the technical effects. If they were there that was nice and we were interested, at least while we got used to them, but you don't revisit a movie out of appreciation for a really well rendered explosion. As some animator guy from WETA Digital said, "the best visual effects are the ones that blend in so well you don't notice them"﻿. We went to the cinema for the story, whether that means watching some swearing American guy in a vest gun down German terrorists to save his wife at Christmas, or see a rich girl and a poor boy find love on a really big boat, or cheer as a famous man with a terrible stutter learns to overcome his fears and gives the speech of his life. I certainly didn't go to see the same film four times because I thought the 3D was nifty, I went because I loved the story of the boy and his dragon. Take the emotional relationships and away and a boat is just a boat, a bunch of guns is just a bunch of guns, a speech is just words without meaning. It's the stories that will stick with us, and not the effects. So even if the multi-million industry of 3D is doomed, again, maybe that's okay because it's no great loss. It will never hurt the stories we love most. Hear hear (or is it, here here?). You make a good point, one that I fear is lost on many 'sfx happy' directors and producers (Lucas, I'm looking at you). The only 3D film I've seen (I think, it's hard to remember, which probably says something about it's general impact) was the aforementioned Dances with Smurfs, and that, while pretty, bored me really, really quickly. I have no tolerance for macho marines who exist purely to be macho marines and who win through because they're the hero, rather than because they're smart and make good points. More than that, actually, all the beautiful CGI in the world (and it was beautiful) cannot cover up the fact that they stuck blue bipedal two-eyed cat people in a world where six-eyed hexapods seemed to be the order of the day. Which bugs the heck out of me, because it makes no sense whatsoever and was clearly only done to make the Na'vi human-like and therefore sympathetic. And that's not even necessary, as things like District 9 and Monsters Inc prove magnificently. If effects aren't thought through, they jar just as much as when they leap out of the screen and try to eat you. I'm glad you brought up District 9 because that was stellar. I went to see it just because it was on and cheap but actually it was great. By the end of it I really had got attached to the buggy cockroach aliens, six legs and all. Unlike George "Look it's digitally remastered! Which means I've included pointless scenes where characters repeat their lines just so I can prove I can computerise a giant slug man realistically! Which I cant!" Lucas. As for (snigger) Dances with Smurfs, I have just one word. "Un-Obtainium". I lauhged once, briefly, and then no more. Oh good grief yes. That, ladies and gents and others, was the sound of Avatar's credibility disappearing in a puff of machismo and neon smoke. I have very fond memories of the original remastering of Star Wars (original remastering? Oh blimey if that doesn't just say it all...) and I think a lot of that - the opening up of the Cloud City vistas, the Sarlac's tongue, even the extraineous Jabba scene were actually legitimate improvements that made the experience richer. It's just, the berk didn't let well alone after that. I didn't like the Sarlaac's tongue. I enjoyed the idea of a creature who can only feed accidentally when stuff falls into his mouth. The whole 'mouth shoots out' thing made it too easy.